Nur Yanah can’t hold back the tears when she recalls hundreds of emaciated boat people arriving in her native Aceh province after being rescued by local fishermen in defiance of the government decision to leave them adrift. The new arrivals were Bangladeshis escaping poverty and ethnic Rohingya fleeing persecution in Myanmar. 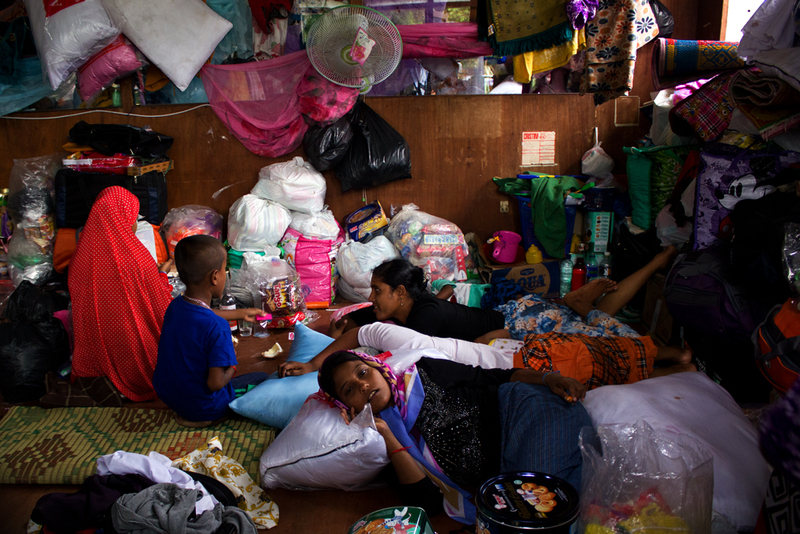 They had paid human smugglers to take them to Malaysia, but many turned out to be traffickers who would hold migrants hostage in camps along the border between Thailand and Malaysia until their families paid thousands of dollars. In early May, Thailand cracked down on human trafficking rings and discovered graves near the jungle prisons. The crackdown created a crisis at sea as smugglers either refused to land or, in many cases, abandoned the boats, leaving their victims adrift with little food and water. Thousands of boat people found themselves at the centre of a regional emergency as Indonesia, Thailand and Malaysia refused to accept them. On 20 May, Malaysia and Indonesia finally agreed to allow the boats ashore – but not before Acehnese fishermen had chosen to ignore their government’s policy and rescue almost 2,000 people. Many in Aceh could not ignore the boat people’s predicament, having themselves suffered terribly during years of ruthless conflict between the Indonesian military and separatist rebels, which only ended when the new horror of the 2004 tsunami devastated the region. Yanah said she sends leftover food from her restaurant to the nearby camp at Kuala Langsa, a port that shelters 425 Bangladeshi migrants and 231 Rohingya refugees. Many refugees have the same hope. “This is the safest place for us,” said Rehama, a 19-year-old Rohingya woman who provided only one name. She left her home in Maungdaw in western Myanmar near the Bangladeshi border with her sister and two daughters, hoping to join her husband in Malaysia. “Now I would like him to join us here in Indonesia,” she said at another camp, Bayeun, which shelters 340 Rohingya and 92 Bangladeshis. The welcome that the boat people have received in Aceh is unmatched anywhere else in the region. On 14 May, Human Rights Watch accused the governments of Malaysia, Thailand and Indonesia of playing “human ping pong” with the boats by refusing to let them land and in some cases even pushing them back into international waters. After intense international pressure, Indonesia and Malaysia finally agreed to provide shelter for the refugees – on condition that they would be resettled elsewhere within one year. The refugees have found no sympathy in their home countries. Bangladeshi Prime Minister Sheikh Hasina was quoted in state media calling them “mentally sick” for endangering their lives and “tainting the image of the country” by getting on the boats. In Buddhist-majority Myanmar, about one million Rohingya Muslims live under virtual apartheid with their movements tightly restricted and with little access to health care and education. Almost 140,000 remain in dismal camps, unable to return to their villages after their homes were burned by mobs of ethnic Rakhine Buddhists during violence in 2012 that killed more than 200 people, mostly Rohingya. But in Aceh, the refugees were welcomed with a concert on 29 May that was organized by Rafly, a popular local singer who like many Indonesians uses only one name. The event was held to raise money for the refugees and it was also a Pemulia Jamee, a traditional Acehnese ceremony to honor guests, which opened with the thunderous beating of more than 50 Rapai Pasee traditional drums. Rafly is also a senator and says he will use his position of influence to advocate for the Rohingya in the capital Jakarta. Once their identities have been established by embassy personnel – who have already visited the camps – the Bangladeshis are likely to be repatriated, but the situation for the Rohingya is uncertain. Almost all Rohingya in Myanmar are stateless after decades of institutional discrimination, including a 1982 law that stripped most of their citizenship. The government and many people in Myanmar refuse to accept the term Rohingya, referring to them instead as “Bengali”, a term that suggests they are migrants from Bangladesh despite the fact that many families have been in Myanmar for generations. Myanmar’s government has launched a verification programme, which aims to grant citizenship to Rohingya who can provide evidence that they qualify. But it has had little success so far and faces resistance from both within the Rohingya community and without. Nationalist ethnic Rakhine Buddhists oppose the programme, because they consider the Rohingya interlopers from Bangladesh, while many Rohingya refuse to participate in it because it requires them to list their identities as “Bengali”. In addition, many Rohingya have lost identification documents over the years, either because they turned them over to the authorities or because they were destroyed during the 2012 violence. The Rohingya in Aceh would likely have difficulty proving they qualify for Myanmar citizenship, while resettlement to a third country could take years. Yet, the camps cannot serve as permanent homes. In Bayeun, Rehama shares a cramped room of about 30 square metres with dozens of other women and children. Men are sheltered metres away in huge tents that barely protect them from the wind and the rain. Still, the makeshift camps are an improvement from the terrible journeys at sea. Mohammad Idiris, a 25-year-old fisherman from Maungdaw, said he was held captive for six months in an overcrowded ship and beaten regularly by human traffickers who demanded a ransom from his parents that they couldn’t pay.